Mogwai’s claim for being the “loudest live band on the planet” gets thrown around quite often — and why shouldn’t it? If your band is reliant on distortion, just crank those knobs and make some eardrums bleed. That is, at least, the mentality for a lot of bands. And while the Scottish post-rock tour de force Mogwai don’t quite fit into that mentality, they are one of the loudest live bands you’ll ever see — a fact that is no doubt agreed upon by everyone who has witnessed the sonic force. 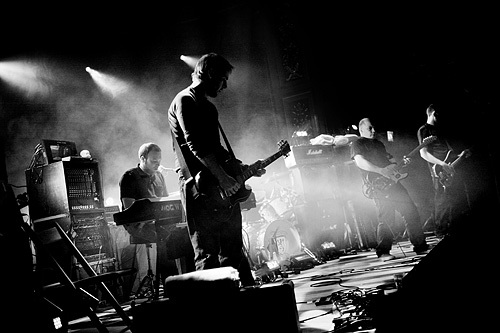 Burning was recorded over three shows Mogwai played in April of 2009 in Brooklyn, New York City. The subsequent black and white film by Le Blogotheque directors Vincent Moon and Nathanael Le Scouarnec attempts the largely impossible task of capturing the ferocity and the serenity of Mogwai on stage. By far and large, the filmmakers succeed. The film opens with “The Precipice”, one of the heavier jams Mogwai are known to break into, and it is clear from this song how the film will unravel — with lots of long takes, lots of close-ups on guitar-playing hands, and lots of contrast. This third aspect is really the key to the film, though. Moon and Le Scouarnec juxtapose a soothing black against a very hard and light white, and it is perfectly fitting to what the band projects through their sound. Mogwai, after all, virtually wrote the book on how to go from nothing to everything in a heartbeat. unlistenable due to sheer noise volume. Once again, Moon and Le Scouarnec do a great job of mirroring the band. The key with Burning is that it is for Mogwai fans only. The film is not a good introduction to the band, because no matter how hard they try, Moon and Le Scouarnec have an impossible task of capturing one of the most dramatic live bands around. At only around eight songs, the film is a bit short, but the filmmakers’ simple and artistic approach lends itself fantastically to Burning.